A collapse of the Puʻu ʻŌʻō crater floor on Monday, May 1, 2018 on Kīlauea Volcano’s East Rift Zone has prompted increases in seismicity and deformation along a large section of the rift zone, with seismicity currently occurring as far east as Highway 130. The migration of seismicity and deformation downrift (east) of Puʻu ʻŌʻō cone following the collapse indicates that a large area along the East Rift Zone is potentially at risk for a new outbreak. A marked increase in seismicity and ground deformation (change in ground surface shape) began at Pu‘u ‘Ō‘ō on Kīlauea Volcano’s East Rift Zone shortly after 14:00 UTC on May 1, 2018, following weeks of uplift and increasing lava level. A few minutes later, a thermal webcam (PTcam) located on the rim of the Pu‘u ‘Ō‘ō crater showed the first of two episodes of crater floor collapse. The second collapse began at 15:20 UTC and lasted about an hour. Shortly after 10:00 UTC, the PTcam recorded images that were likely the signature of small explosions from the western side of the crater as the floor collapsed. 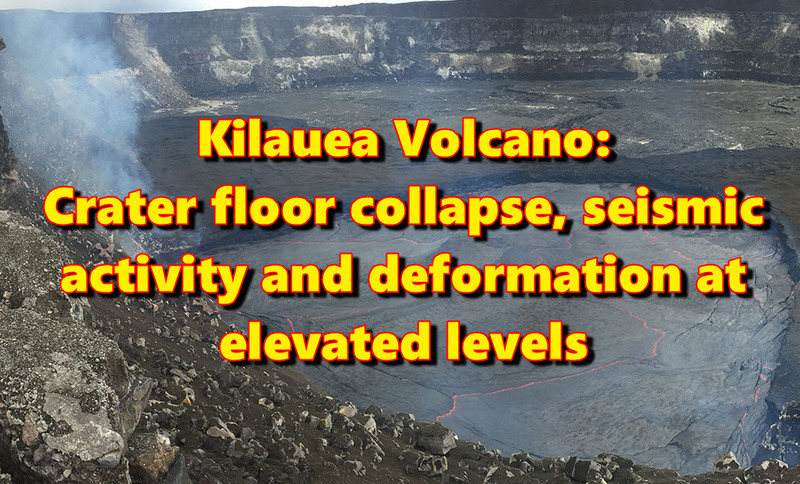 Following the collapse, HVO seismometers and tiltmeters recorded an increase in seismic activity and deformation from Kīlauea Volcano’s summit to an area about 10 - 16 km (6 - 10 miles) downrift (east) of Puʻu ʻŌʻō. This activity later localized downrift of Puʻu ʻŌʻō and continued to propagate eastward along the rift zone. The largest earthquake of this sequence so far was a magnitude 4.0 earthquake just offshore south of Pu‘u ‘Ō‘ō at. Kīlauea’s summit eruption has thus far not been affected by the change at Pu‘u ‘Ō‘ō. At 05:56 UTC on May 2, HVO reported that increase in seismicity and deformation at Kīlauea Volcano's East Rift Zone east of the Pu'u 'Ō'ō vent continues. "The activity is associated with the intrusion of magma eastward from the Pu'u 'Ō'ō magma system," HVO geologists said. "Since this morning, seismicity rates in the lower East Rift Zone east of Highway 130 have increased and an outbreak of lava in a new location remains a possible outcome of the continued unrest. At this time it is not possible to say with certainty if or where such an outbreak may occur, but the area along the East Rift Zone downrift (east) of Pu'u 'Ō'ō remains the most likely location." HVO urged residents of the Puna District to remain alert and watch for further information about the status of the volcano. Watch for Hawaii County Civil Defense messages at http://www.hawaiicounty.gov/active-alerts/. About 250 located earthquakes have occurred since the Pu'u 'Ō'ō collapse event. Since that time, earthquakes have migrated eastward from Pu'u 'Ō'ō to the lower East Rift Zone. Since around 20:00 UTC on May 1, seismicity rates in the lower East Rift Zone east of Highway 130 have increased slightly on two seismic stations. The seismicity consists primarily of small-magnitude (less than magnitude 3) earthquakes at depths of less than 10 km (6.2 miles). Many of these earthquakes have been felt by residents in the area. A tiltmeter on the Pu'u 'Ō'ō cone has recorded a steady deflationary tilt since late last evening, with several sharp inflation offsets. These offsets probably recorded the continued episodic collapse of the crater floor. A tiltmeter located 12 km (7.5 miles) east of Pu'u 'Ō'ō has recorded a slowing rate of southeastward-directed tilt of the ground along the East Rift Zone, suggesting diminished but continued deformation associated with the intrusion into the lower East Rift Zone. Kīlauea's summit eruption has thus far not been affected by the change at Pu'u 'Ō'ō. Tiltmeters at the summit have recorded a slight deflationary trend since early this morning, and the level of the summit lava lake lowered by a few meters (yards). During a helicopter overflight to Pu'u 'Ō'ō on May 1, geologists observed a new fissure and crack extending about 1 km (0.6 miles) uprift (west) from the west flank of the Pu'u 'Ō'ō cone. A small amount of lava erupted from the crack during the collapse of the Pu'u 'Ō'ō crater floor. Geologists also noted red ash that was deposited around Pu'u 'Ō'ō and blown farther downwind; the ash resulted from small explosions that accompanied the collapse of the crater floor. Poor weather and an ashy plume from the Pu'u 'Ō'ō crater prevented geologists from observing the newly collapsed crater floor or the west pit area where a perched lava pond was erupting before yesterday's collapse event. Geologists observed a few small, sluggish breakouts of the 61g lava flow, likely from lava still moving through the lava-tube system. The 61g vent was likely severed from the magma supply to Pu'u 'Ō'ō. Geologists did not observe any new ground cracks downrift of Pu'u 'Ō'ō in areas where seismicity was concentrated over the past day. The migration of seismicity and deformation downrift (east) of Puʻu ʻŌʻō cone following Monday's collapse indicates that a large area along the East Rift Zone is potentially at risk for a new outbreak. The location of any future outbreak will determine what areas are in the path of new lava flows.